MJH Apps announces the launch of the Watch Me Change iPhone app. This app reminds the user to take a photo of themself or someone else everyday, then creates a time lapse video of the person changing. It let’s you see a beard grow, a diet happen, or a child grow up. Watch one year of change in 10 seconds. With this app, you can watch 1 year of change happen in 10 seconds. Complete flexibility to take pictures as your face changes. There is no need to be in the same place or wear the same clothes since the overlay option properly matches your photos. Utilizes gridlines or a ghost image of a previous photo to make sure you are in the same place for the photo every time. Multiple users can use the app, so you can have several creations going on at the same time. Full controls over the final product, with the ability to remove specific images from the video, adjust the length of the video, or add music from your iPod library. Tools to upload your video to social networking sites like Facebook, Twitter, and YouTube or watch the video from your iOS device. 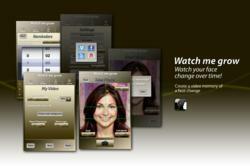 “Watch Me Change Face is a fun, entertaining app that creates a time lapse video of you or someone you know changing. From growing a beard, watching your pregnant wife’s belly grow, or aging with grace, Watch Me Change is a fun video memory for cataloguing our lives,” said Mike Hall, Founder and CEO of MJH Apps. “For parents, this app is a perfect means of archiving a child’s progress from newborn to infant and beyond. Simple to use and fun, Watch Me Change is an opportunity to share life’s best memories with friends and family worldwide ,” continued Hall. With the innovative design and ease of use, the Watch Me Change app is sure to be a hit with every segment of society, from parents, to children to professionals. MJH Apps designs the innovative series of Watch Me Change apps, which create time lapsed videos for people to share and discuss. By simply taking a photo of yourself each day with your mobile device, you can chart everything from weight loss to pregnancy to the development of a child. Men can even catalogue changes in their own appearance, especially when growing a beard or undergoing other fun updates to their appearance. For more information, please visit http://www.watchmechangeapp.com, or watch the one-minute explainer video on that page.